History of Brazilian Jiu-Jitsu | Third Law Brazilian Jiu-Jitsu: Naples / Fort Myers / Bonita Springs / Estero, Florida's Elite Brazilian Jiu Jitsu ( BJJ ), Judo, Submission Wrestling, & No-Gi Grappling Program. Brazilian Jiu-Jitsu (BJJ) is a martial art and combat sport that focuses on grappling and especially ground fighting with the goal of gaining a dominant position from which to force an attacker to submit. The system developed from a modified version of Judo including some techniques from Japanese Jujutsu and with a focus on ne-waza (ground technique). It promotes the principle that a smaller, weaker person using leverage and proper technique can successfully defend themselves against a bigger, stronger assailant. BJJ can be trained for self defence, sport grappling tournaments (gi and no-gi) and mixed martial arts (MMA) competition. Sparring and live drilling play a major role in training, and a premium is placed on performance, especially in competition. The art began with Mitsuyo Maeda (later known as Count Koma), a Japanese expert judoka and member of the Kodokan. Jigoro Kano sent Maeda overseas to spread his Judo to the world. Eventually, Maeda immigrated to Brazil in the 1910s where an influential businessman named Gastão Gracie helped him get established. In return for his aid, Maeda taught the fighting art of Jujitsu to Gastão's son Carlos, who then taught the art to his brothers, including Hélio Gracie. The brothers trained many of their sons, who carried on the family tradition. Hélio had the opportunity to teach a class one day while Carlos was absent. He soon realized that most of the techniques could be adapted in a way to increase leverage therefore minimizing the force needed to execute the moves. Through Hélio's experiments early on, and constant technical refinement in training and real fighting, Brazilian Jiu-Jitsu as we know it today was created. 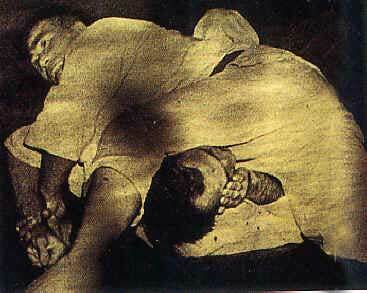 The Gracie family continued to develop the system throughout the 20th century, often fighting vale tudo matches (precursors to modern MMA), during which it gained its focus on ground fighting and refined its techniques. 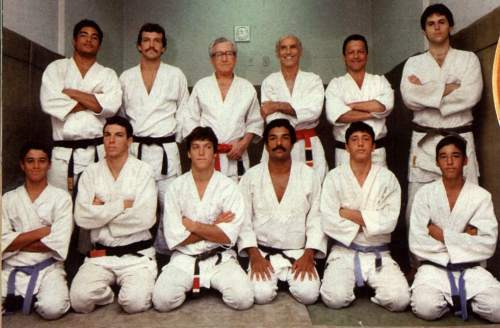 Other contributing factors to the stylistic divergence of BJJ include the Gracie's desire to create a national martial art, the influence of Brazilian culture, the Gracies emphasis on full-contact fighting and self-defence, the post-World War II closing of the Kodokan by the American Occupation Authority (which were only allowed to reopen on the condition that emphasis be shifted towards sport), as well as the Gracies' additions to the body of technique and theories regarding self-defense, martial arts and training methods. Brazilian Jiu-Jitsu came to international prominence in the martial arts community in the 1990s, when Brazilian Jiu-Jitsu expert Royce Gracie won the first, second and fourth of the Ultimate Fighting Championships, a single elimination martial arts tournament against sometimes much larger opponents who were practicing other styles, including boxing, shoot-fighting, karate, judo, tae kwon do and wrestling. It has since become a staple art for many MMA fighters and is largely credited for bringing wide-spread attention to the aspect of ground fighting. Sport BJJ tournaments continue to grow in popularity worldwide and have given rise to no-gi submission grappling tournaments, such as ADCC. Hélio competed in several judo competitions where most ended in a draw, one defeat came by Masahiko Kimura, whose name was placed on top of the arm lock used to defeat Helio officially. In a much later interview, Helio admitted that he was choked unconscious early in the fight but regained consciousness quickly and avoided losing early. There are many accounts of what transpired during their fight, ranging from Kimura mocking Helio's stance and openly insulting him, to Kimura being so impressed with Helio's performance that he invited Hélio to teach in Japan. Today, Hélio teaches οccasionally in Brazil and accompanies his sons during fights.The art is sometimes referred to as Gracie Jiu-Jitsu (GJJ) but this name is trademarked by Rorion Gracie and specifically refers to the style taught by him and his selected teachers. Other members of the Gracie family often call their style by personalized names, such as Charles Gracie Jiu-Jitsu or Renzo Gracie Jiu-Jitsu, and similarly, the Machado brothers call their style Machado Jiu-Jitsu (MJJ). While each style and its instructors have their own unique aspects, they are regarded as variations of Brazilian Jiu-Jitsu. The most important factor that differentiates Brazilian Jiu-jitsu from Judo and some schools of Japanese Jujutsu is that BJJ places a decided emphasis on ground fighting. While Japanese Jujutsu and Judo do incorporate training in ground fighting (newaza), with some schools favoring more ground techniques than others, few Japanese schools put as much emphasis on ground techniques as BJJ. Some, if not the majority, of BJJ schools overlook most throwing techniques entirely. Such a training regime is responsible for the great advances in ground fighting introduced by Brazilian Jiu-jitsu, and also for weaknesses in standing grappling, which some remedy by cross training in Judo and/or Wrestling. In addition, like Judo, Brazilian Jiu-jitsu encourages "randori" or free sparring against a live, resisting opponent. Thus, students have an opportunity to test their skills and develop them under realistic conditions, while minimising the risk of injury. It is sometimes assumed that Maeda was an expert in Jujitsu, however, while in the late 1800s Judo was considered a school of jiu-jitsu and he could use the terms interchangeably, Maeda only trained in traditional Jujitsu very briefly as a child and it is interesting to note that old Kodokan records have Hélio Gracie to be recorded as a 3rd dan in judo. Martial art historians have stated that the term jiu-jitsu was used to differentiate from the term judo which was already popular. Some argue that the differences are more in culture and moral goals than in the physical principles and techniques of BJJ; however, the considerable differences between BJJ and the Japanese styles include more emphasis on strikes on the ground, and holds and joint locks forbidden in sport Judo but taught in practical Judo or traditional Jujutsu. Today, the major difference of Gracie/Brazilian Jiu-Jitsu styles lies between Helio Gracie's Traditional Gracie Jiu-Jitsu for self-defense and Sport Brazilian Jiu-Jitsu designed for point competition, there is however a large crossover in techniques between the two. Brazilian Jiu-Jitsu is designed for one-on-one fighting. It emphasizes ground fighting techniques and submission holds involving joint-locks and chokeholds also found in numerous other arts with or without ground fighting emphasis. The premise is that most of the advantage of a larger, stronger opponent comes from superior reach and more powerful strikes, both of which are sometimes negated if grappling on the ground. BJJ includes many Judo and wrestling techniques to throw or tackle opponents to the ground which revolve around using the primary bases of the body, the hips and shoulders. These takedowns are difficult to counter without training. Once the opponent is on the ground, a number of manoeuvres (and counter-manoeuvres) are available to manipulate the opponent into suitable position for the application of a submission hold. This system of manoeuvring and manipulation can be likened to a form of kinetic chess when utilized by two experienced practitioners. A submission hold is the equivalent of checkmate. Submission holds can be grouped into two broad categories: joint locks and chokes. Joint locks typically involve isolating an opponent's limb and creating a lever with your own body position which will force the joint to move past its normal range of motion. Pressure should be increased in a controlled manner and released if the opponent cannot escape the hold and signals defeat by submitting. The commonly accepted form of submission is to tap the opponent, gym mat, or even yourself, three times. Verbal submission is also acceptable but less common. Alternatively, one could apply a choke hold, disrupting the blood supply to the brain, causing unconsciousness if the opponent refuses to tap out. Most BJJ "chokes" involve constriction of the carotid artery (causing hypoxia). Technically these are not "chokes" but "strangles," however the term "choke" is often erroneously used to cover both chokes and strangulations. This differs from the more instinctive choking movements which generally involve constriction of the windpipe (causing asphyxia) - a legitimate choke. Though this distinction may at first seem subtle it is in fact significant (commonly referred to as "blood" and "air" chokes respectively). Air chokes are highly inefficient and may result in damage to the opponent's trachea, sometimes even resulting in death. In contrast, blood chokes (strangulations) directly cut the flow of blood off to the opponent's brain causing a rapid loss of consciousness without damaging the internal structure. Being "choked-out" in this way is actually relatively safe as long as the choke is released soon after unconsciousness, letting blood (and therefore oxygen) back into the brain before the damages of oxygen deprivation begin. However, it should not be practiced in an unsupervised atmosphere. The prevalence of the dangerous "air" chokes has actually led to the banning of chokeholds from some United States police departments. Because of the negative legal connotations of the words choke and even strangulation one is advised to use the term "lateral vascular restraint" when describing a blood choke used in a self-defense situation. Brazilian Jiu Jitsu's limitation to submissions without the addition of strikes while training allows practitioners to practice at full speed and almost full power, resembling the effort used in a real competition. While many joint locks are permitted, most competitions bar or restrict some or all joint locks involving the knees and spine. The reasoning behind this being that the angles of manipulation required to cause pain are nearly the same to cause serious injury. Joint locks that require a twisting motion of the knee (called twisting knee locks or twisting knee bars) are usually banned in competitions as successfully completing the move nearly always results in permanent damage that requires surgery. Similarly, joint manipulations of the spine are typically barred due to the inherent danger of crushing or mis-aligning cervical vertebrae. In Brazil, certain locks involving the knees and ankles are only allowed in competition starting at the brown belt. Any competitor from white to purple belt who tries any of these locks may be disqualified. However, most joint locks involving the wrist, elbow, shoulder or ankle are permitted as there is a great deal more flexibility in those joints and are safe to use under tournament conditions. Also, in lower levels of competition, some fighters practice moves whose sole purpose is to inflict pain upon their opponent, in the hope that they will tap out. This includes driving knuckles into pressure points, holding their opponent's head in order to tire out the neck (called the "can opener" or kubi-hishigi) and putting body weight on top of the sternum, floating ribs, or similarly sensitive bones. These moves are not true submission moves and are avoided or brutally countered in middle to upper levels of competition. Generally, they are used as distractions. The main emphasis in Brazilian Jiu-Jitsu is to dominate the opponent through application of technique and force them to quit (submit). By using the techniques of Brazilian Jiu-Jitsu, a smaller practitioner, male or female, can control much larger and stronger opponents and actually force the larger opponent to submit. The standards for grading and belt promotions vary between schools, but the widely accepted measures of a person's skill and rank in Brazilian Jiu-Jitsu are (1) the amount of technical knowledge they can demonstrate, and (2) their performance in sparring and competition. Technical knowledge is judged by the number of techniques a person can perform, and the level of skill with which he performs them in sparring and competition. This allows for smaller and older people to be recognized for their knowledge though they may not be the biggest and strongest fighters in the school. It is a distinctly individual sport, and practitioners are encouraged to adapt the techniques to make them work for their body type, strategy, and level of athleticism. The ultimate criterion is the ability to execute the technique successfully, and not stylistic compliance. Competitions play an important role in the grading of Brazilian Jiu Jitsu, as they allow an instructor to compare the level of his students against those of the same rank in other schools. A belt promotion may be given after success in a competition, particularly at the lower belts. A promotion might also be awarded when a person can submit most people in his school of the same rank, e.g. a white belt who consistently submits most other white belts in sparring and is starting to catch blue belts. The high level of competition between schools and its importance to belt promotion is also considered to be one of the key factors preventing instructors from lowering standards or allowing people to buy their way up the belts. Many instructors also take the personality of the person and their behavior outside of class into account, and may refuse to promote someone if they exhibit antisocial or destructive tendencies. It is by these and other criteria that most instructors promote their students. A few schools may also have formal testing and include oral or written exams. 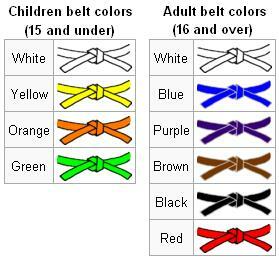 Also, some schools may use a stripe system for each level belt, meaning that they must progress through a certain rank for each belt. There are minimum age requirements for belt promotions. Blue belts are never awarded to anyone under the age of 16. For promotion to black belt the minimum age is 18 years old or older according to the main regulating body of Brazilian Jiu Jitsu, the International Federation of Brazilian Jiu-Jitsu. Stripes may be awarded to any rank below black belt, but like the belts themselves, tend to be given at the instructor's discretion, and may be in recognition of accomplishments like noticeably improving or victories in a tournament. However, not all schools award stripes, or award them consistently, so the number of stripes a person has is not necessarily a good measure of their accomplishments or time in training. When they are used, it is standard for a student to receive 4 stripes before being promoted to the next rank. Black belts can receive degrees for as long as they train or teach the art. At 8th , the black belt is replaced by an alternately red and black belt. At 9th & 10th degree the belt becomes solid red. Only the founding Gracie Brothers Helio,Carlos & his brothers will ever have the 10th degree red belt. The Gracie family members who are 9th degrees belt holders are Carlson Gracie, Reylson Gracie and Rorion Gracie who was promoted on October 27, 2003 by his father Helio Gracie. 1. ^ Peligro, Kid (2003). The Gracie Way: Illustrated History of the World's Greatest Martial Arts Family. Invisible Cities Press Llc. ISBN 1-931229-28-7. * International Federation of Brazilian Jiu Jitsu. Graduation System, Rules. ibjjf.org. URL last accessed July 13, 2006.